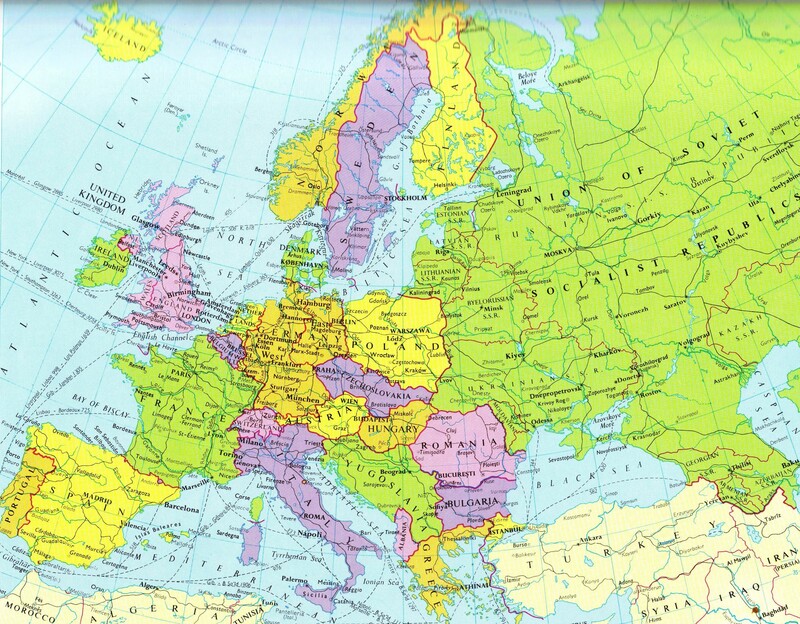 Thirty years ago or so I had an aspiration to visit all of the countries in Europe. In 1990 this was not such an ambitious target as it is now because there were a lot less countries before the break-up of the Soviet Union and Yugoslavia. 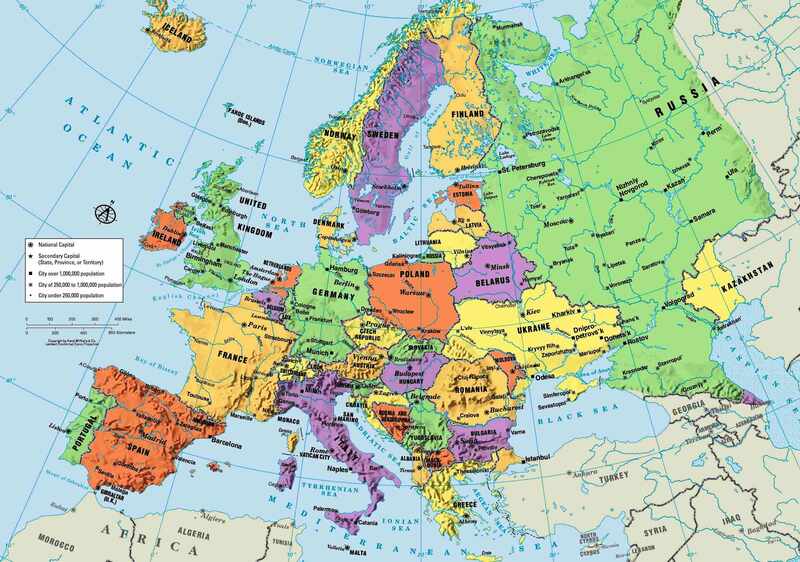 Today there are fifty countries in all and as European boundaries keeps changing and new countries are being created I am sorry to say that the moving target has eluded me. The last time that I visited a new country was in 2010 when I travelled to Montenegro in the Balkans. In 2013 I nearly made it to Andorra but it was such a long and arduous drive through the Pyrenees that I gave up at just about the half way point and turned back to Catalonia. Catalonia might be an independent country itself one day and I have been there already. Now I am not nearly so ambitious and there are some countries that I realise that I really have no need to visit, Albania springs to mind, so I am sticking to the obvious places in Europe simply because there is so much that I haven’t yet seen of Spain or France or Germany or of course Italy. So now we were in Italy, the first European country that I ever visited, in the city of Rimini on the Adriatic Riviera and only twenty miles or so away from the independent country of San Marino and it seemed rude not to visit so one sunny morning we walked from our hotel to the bus station and purchased our tickets. 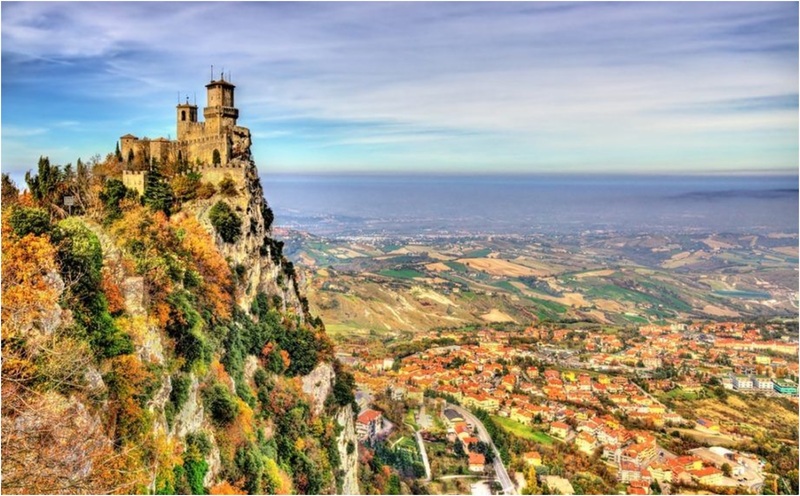 San Marino is the fifth smallest country in the World (it is .0008% the size of Australia) and the third smallest in Europe, with only Vatican City and Monaco being tinier. It is also World’s smallest Republic. I have been to the Vatican City but not to Monaco. Nearly fifty years ago at University I studied the ‘Unification of Italy’, it was my specialist subject, but I don’t remember it ever occurring to me to wonder why San Marino is an independent State (perhaps that’s why I didn’t get a First) and not simply a part of greater Italy because Italy is one hundred and sixteen thousand square miles of territory and San Marino is only twenty-three (.02%). Visiting the country made me belatedly curious. One explanation offered is that during the wars of Italian unification Giuseppi Garibaldi (he keeps cropping up) in 1849 was on the run from Austrian, French, Spanish and Neapolitan troops and sought refuge for himself and his small army in San Marino where he was given welcome and refuge. 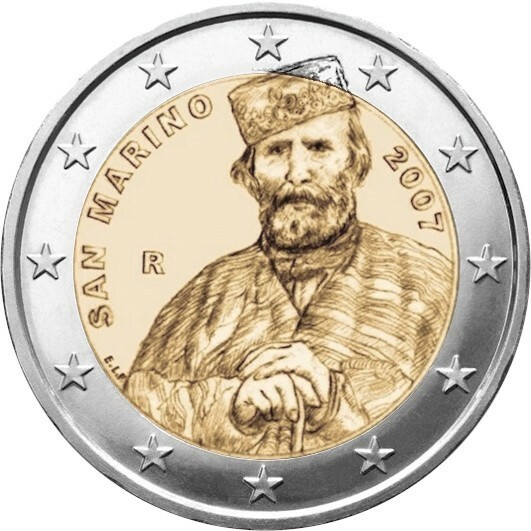 In recognition of this support Garibaldi accepted the wish of San Marino not to be incorporated into the new Italian state and in 1862 a friendship treaty guaranteed its continuing independence. In 1944 neutral San Marino again offered refuge to over one hundred thousand refugees and Italian Jews displaced by the Allied advance and fierce fighting in Northern Italy at the battle of Rimini. In preparation for travel I carried out my usual research and used my favourite benchmarks to try and understand the country that I was visiting. This didn’t take very long. Being so small it doesn’t even get a mention in the Human Development Index or the World Happiness Index although I imagine that if it was included that it would do rather well in both on account of its affluence and wealth. Being landlocked it obviously has no Blue Flag Beaches. San Marino has participated in the Eurovision Song Contest nine times and its best performance was to finish twenty-fourth in 2014. San Marino used to have a Formula 1 Grand Prix but it is no point looking for the circuit because that was in Imola in Italy because this was a way that the Italians managed to get themselves two race meetings every year when other countries only had one. 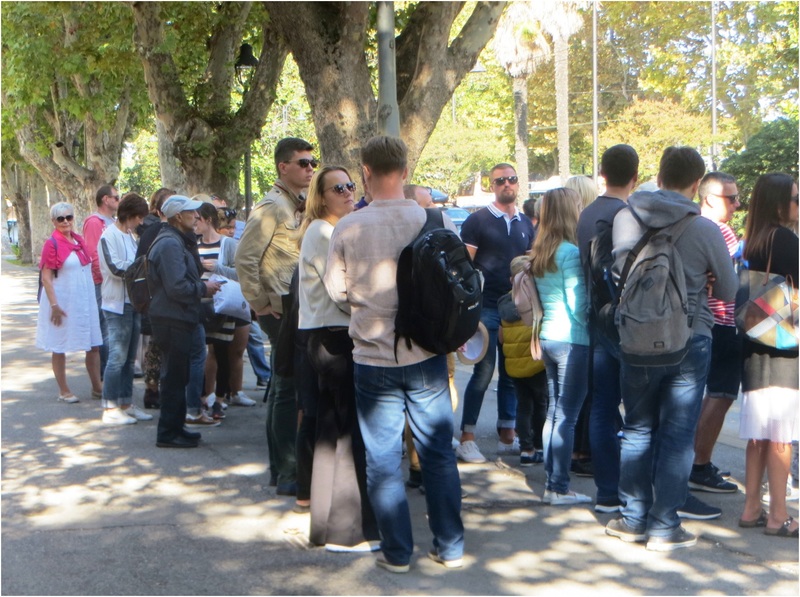 Because this was Italy there was of course no queue at the bus-stop, just a disorderly crowd of people that was steadily getting larger and more excitable as we waited. Eventually it arrived and my worst fears were realised when any semblance of order was completely abandoned and the crowd surged forward like a river breaking its banks into a flood. Kim is much better in these crowd tsunami situations than I am and she soon left me well behind as she elbowed her way forward through the people as though she was in a rugby scrum and she was on the bus a good five minutes before I was able to squeeze myself through the door and flop exhausted into the seat beside her. Eventually the vehicle was full and fit to burst at the seams and it pulled away from the bus stop and I began a journey to my thirty-first European country – as things stand only another nineteen to go. This entry was posted in Beaches, Cathedrals, Europe, History, Italy, Literature, Postcards, Travel, World Heritage and tagged Adriatic Coast, Garibaldi San Marino, Italian Unification, Italy Bus Travel, Rimini, San Marino, UNESCO San Marino. Bookmark the permalink. It could become an even bigger job in the future! So interesting. How fantastic to be an independent republic since the 1300s. Fascinating history, most countries have some history of different forms of government. Thanks for stopping by. 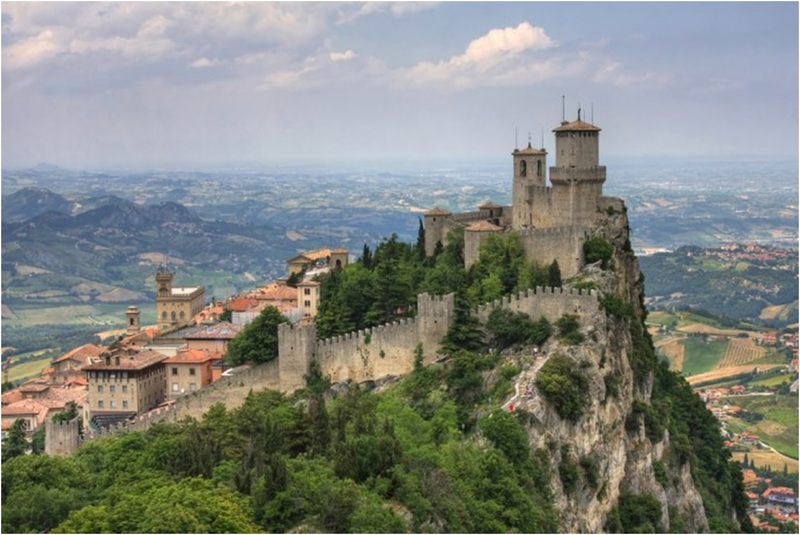 Nice piece of history, never been to San Marino, though I did battle through the mountains once and spent a day in Andorra. All I can remember is a long street filled with shops selling cigarettes, tobacco and booze. Surely there’s more? What was your verdict on Vaduz? Couldn’t say, I was about 14!! By the way, closest I’ve been to Albania was at our local “Car Wash &Valet” spot on Friday, I learned quite a lot in 30 mins while I waited. We have a lot of them. I never use them. The VW garage washes my car every year at MOT whether it needs it or not! A dirty new Jag on my drive would give the neighbours completely the wrong impression. Standards! I park my VW close to the hedge out of sight! A German car? Not surprised you hide it! I always bring my French wine inside after dark! I always take Waitrose bags to ALDI to hide the shame! But you’ve just told the whole planet🤦‍♂️! It is going to be a problem post BREXIT. I liked your survey BTW! I voted leave but am coming to the view that we need a People’s Vote on the terms of the withdrawal. I can’t honestly see how that could work or even what the questions would be. It’s about general principles rather than details. General principle says leave with control over three things, then start negotiating trade. But there can be NO negotiating over budgets, borders, military, territory. None. The vote would be about detail but you are right, most people would not understand it! Me included, but fishing waters rights for example should not be traded off for example for access to Galileo rights. There should be no divorce bill either, we should not pay cash for anything at all because as soon as we leave any benefits related to those payments has ended. Being a part founder of projects doesn’t wash either since the outcome of that project won’t be available to us. However investment we made into structural features such as buildings, existing hardware and technology should be repaid to us. What pensions? As far as I’m aware none of our pensions are EU related, but even if they were I would think that they would be regulated just the same way as air space is regulated and NOTHING to do with the EU? Tell me more. All the people who work for the EU of course! Someone has to pay for it though Brian! Do you know how pensions work? I think so Brian. But I doubt EU officials make any contributions (as I did) but rely on taxpayers to fund gold-plated schemes! Have I got that wrong? Pension funds are supposed to be ring fenced and separated from other “corporate assets” as well as being managed by independent fund managers. I’m sure there are rules similar to capital adequacy rules too so the size of the fund must be “adequate” to meet the requirements of the day. There have been numerous articles about this in various media but these are the easiest ones to follow. Prediction that the EU fund will collapse by 2026 which is why they are disguising their panic over our Leaving. Also their rules on “receivers” like Mandelson, Kinnock and many of the House of Lords being forced to stay loyal to the EU are hilarious and worth reading here too. I do not doubt any of that Brian. So long as my pension pot remains secure I don’t really care even if I have to pay towards the privileged few who will benefit for years to come! I rarely read the Daily Express – so much crap! I have to assume that some financial genius is managing the fund well enough to continue my monthly payments arriving on time and in full. Enough, I’m struggling to see the screen now as I peel shallots and red cabbage for pickling! I’ll send you a jar of my green tomato chutney! Don’t forget the fastest ever goal against England! Thank you Stuart Pierce…….seven seconds I think it was. Thanks for that. I have been to Andorra (44 years ago) and already I feel that I would have preferred San Marino. And I drove through Monaco but didn’t notice it. But I did like Italy.
. . . I would love a house like that . . .
To live on top of a mountain! Nice post. I have not been there yet but maybe next year. Liechtenstein booked plus Malta & Andorra to go. You should venture to Albania if you get the chance. Even a day trip from Corfu is worth it – only 30 minutes by ferry. I’ll go to Albania when you have been to Malta! You may live to regret that! Albania is actually a great destination, a real throwback. Kosovo even more so. I planned to go there when I was in Montenegro but the Foreign Office advice on driving put me off! Fascinating! And I never realised the San Marino GP was in Imola….never been to San Marino, but I have driven round the Imola circuit! Worth a visit but don’t get disappointed if you never make it there! Looking forward to the next section as I’ve never been to San Marino but will make it one day. Like one of your correspondents above, I would say do go to Albania, lots to see there and the people are nice, honestly! And just to add my six penneth to the comments about Brexit above, I’ll opt for the rule of the EU in preference to the rule of the completely unelected House of Lords with its collection of dodgy businessmen, sports stars, show-biz favourites, ex-parliamentarians and ‘entitled’ aristocrats who make laws on my behalf. Get rid of them and then think about outside influences. Fair point about the HoL but I suspect that we are stuck with it. I’ll take your word about Albania! Got to be realistic Derrick! Andrew, I think my reply may have gone into spam because I included 2 links for you to read about EU pension collapse and Mandelson, Kinnock and others in HoL being forced to stay loyal to EU or losing their pensions! Can you check? That’s Life Brian, some people take a lot more out than they ever gave! I don’t object to them getting a pension in any way shape or form. But I object strongly to the condition of them receiving a pension being based on harming me and mine! I am just saying that pensions are a financial obligation/liability. It is just an example of our commitment to EU and I am certain that there are many more. I did vote leave! As you said, the world has changed quite a lot after the early 1990’s and I think, travel has become much more easier now compared to the Cold war days. I call her my battering ram! Nice, I enjoyed your post. The first paragraph was lovely and hilarious. As was the rest. Oh, Italy, what a wonderful place. Great post!